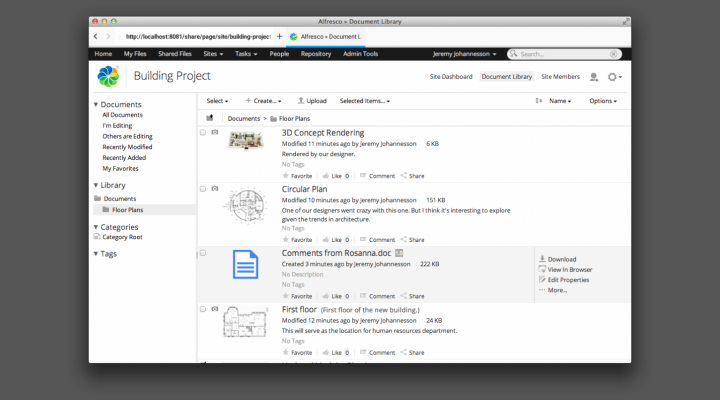 It is not a secret that Alfresco comes with the ability to share files with external users. 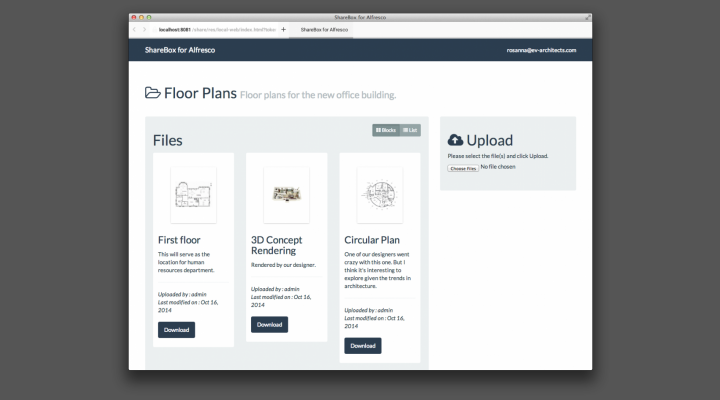 However, we figured out that this function doesn’t serve most of external sharing requirements that users are in need. We believe you’ll see why when you’re done reading this post. 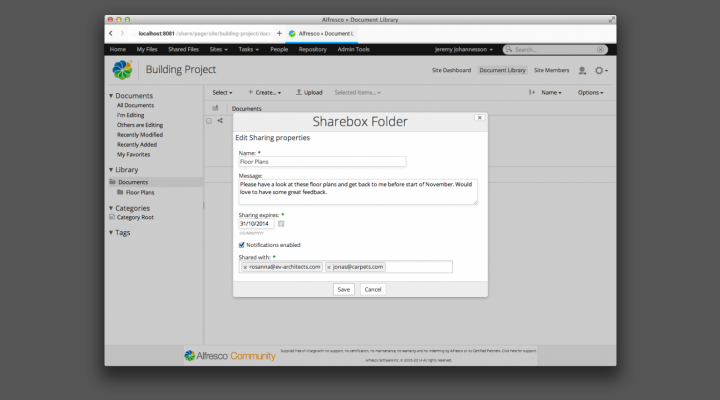 Therefore we built a custom sharing add-on for Alfresco called ShareBox for Alfresco. 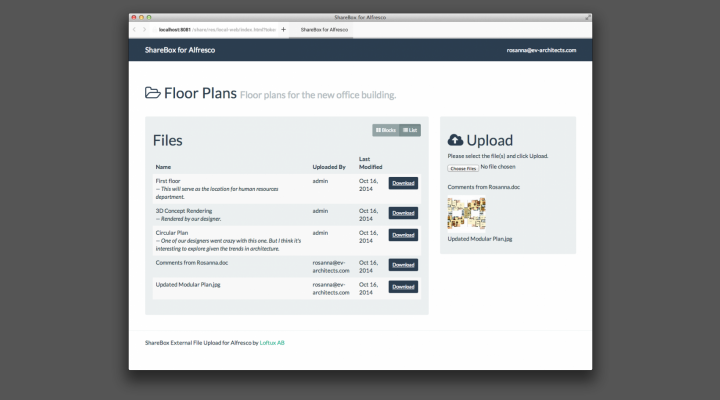 This blog post provides information on how ShareBox can super-power your Alfresco installation to be the one-stop content hub for your organisation. ShareBox is built to be secure. We use a number of industry standard techniques to ensure every access to shared content is secure. 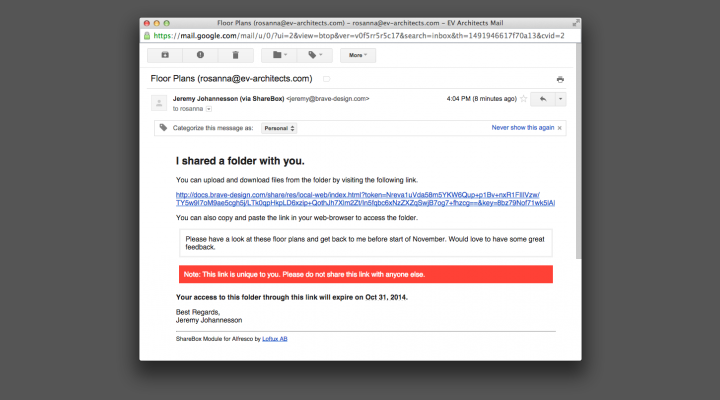 Every action performed to share a folder through ShareBox is auditable. Share a folder to multiple external users at the same time. Add an expiry date to the shared folder. For a given folder all the shares become invalid when the expiry date is reached. You can choose to send a custom email notification to all the external users for a shared folder. These email notifications could include a custom message. Built in Sweden and as with almost with every Loftux Product, ShareBox is multilingual by nature. 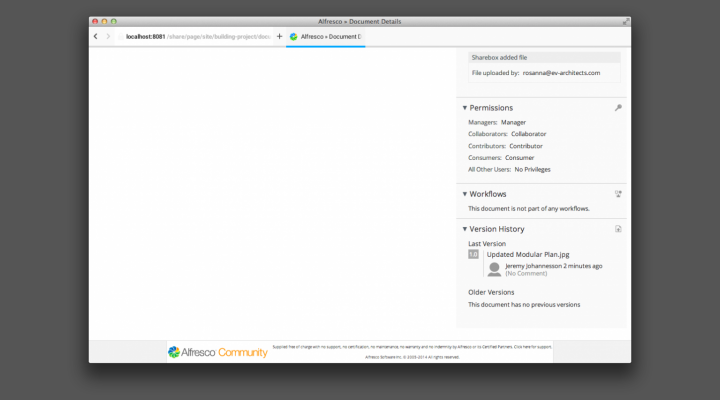 Once you have ShareBox installed, you get access to a custom Alfresco action that can be used by you/your developers that can be reused anywhere within Alfresco. External users who access the shared content are presented with a mobile-friendly, beautiful view of the folder including important information about the files and folders that are shared. When a folder is shared to an external user, the user gets a unique token with a link. This is used for login and can be manually deactivated any time. It cannot get any simpler. External users can download content from the shared folder as well as upload content without overwriting any shared content. 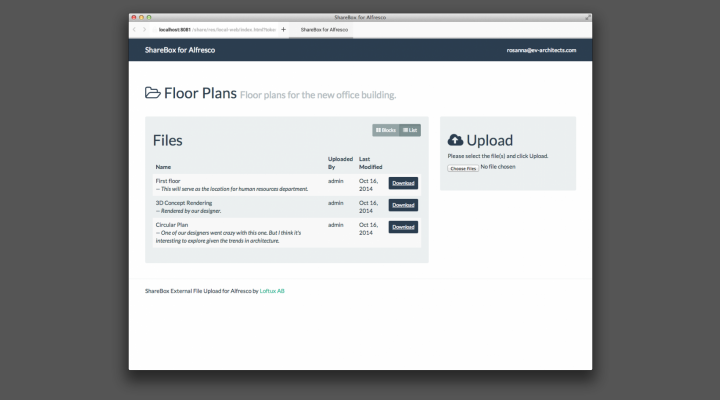 The information on who uploaded and when, is available to the internal user who shared the content. 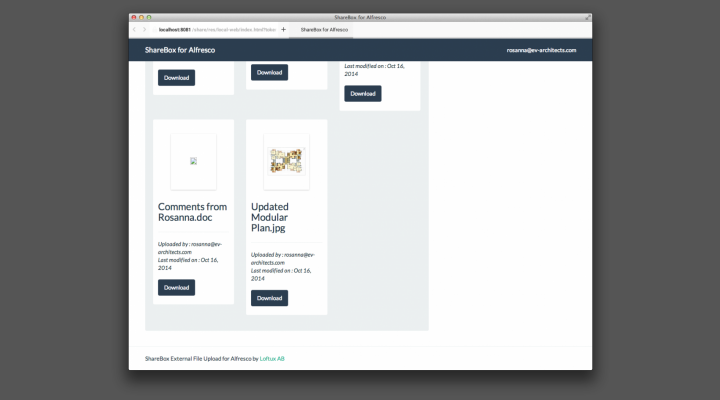 Thumbnail previews are provided for external users who view the folder through the external interface. In most organisations nothing gets past without a custom beautiful design. 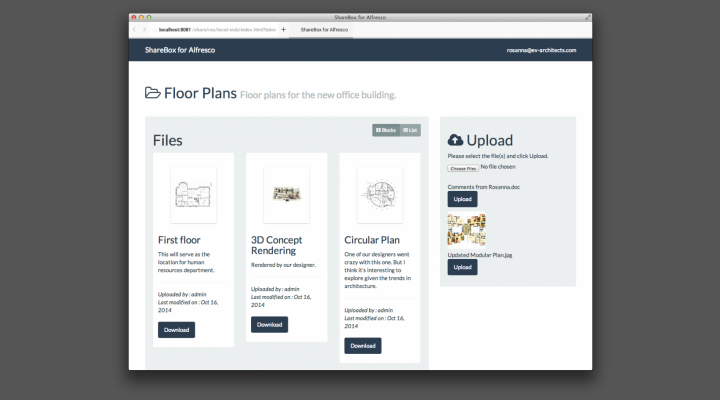 The external sharing interface can be customised to fit your company design and theme with ease. 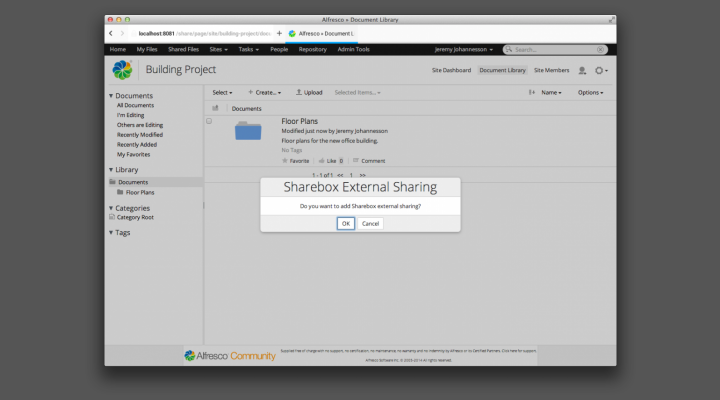 ShareBox for Alfresco is the best external sharing solution you can get for Alfresco. And we’re pretty much sure that it’s affordable than having to build one separately for your Alfresco installation. 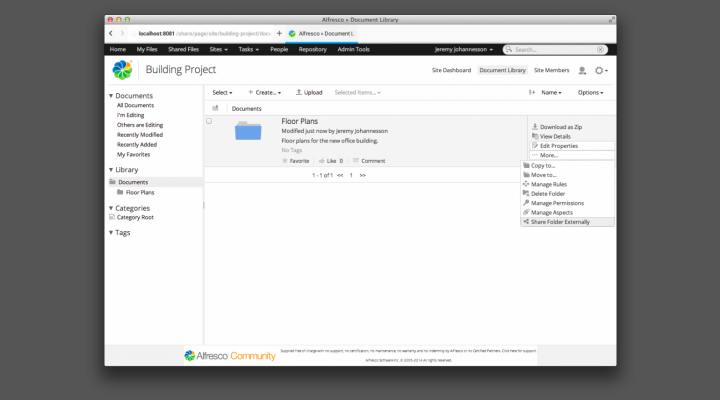 It is available for both Alfresco Enterprise and Community Editions and supports the latest version of Alfresco One. If you’re interested in purchasing this add-on for your Alfresco installation or your customers/partners, please contact Peter at .